View the threads critterologist has started. Leave feedback for critterologist or read feedback left by other members. View the member feedback critterologist has written of others. "We've lived in Frederick since 2001. Our cottage-style garden will probably have that "work in progress" look for many years to come, LOL. I've been having a lot of fun writing articles for DG -- look for them on Thursdays. 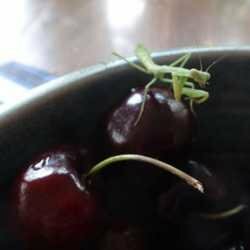 ("contact buddy" info: post on the Mid-Altantic forum; lots of folks know me there)"
"Baby mantis in our kitchen, LOL Is his life just a bowl of cherries?"